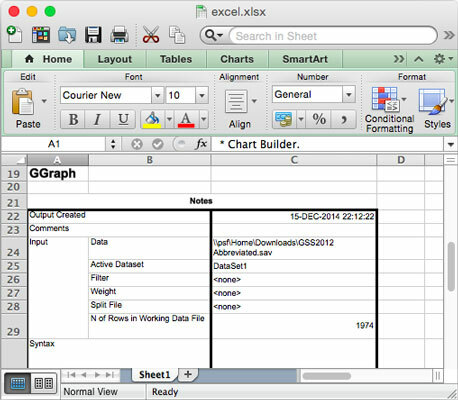 Creating an Excel file from your SPSS data is easier than creating either a text file or an HTML file because the images are not generated as separate files — graphic images are included in the worksheet. (The options for creating an Excel file are shown in the following figure.) You get to choose how pivot tables, footnotes, captions, and models are handled, as described for HTML files. The choices you have when producing an Excel file. By default, a new workbook file is created. If a file with the same name already exists, it’s overwritten. You can specify that a new worksheet be created within the workbook file; however you must specify the name of the worksheet. If the worksheet name you choose already exists in the workbook, the file that has it is overwritten. 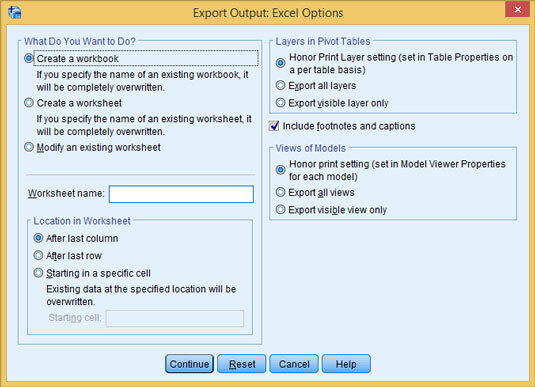 Alternatively, you can specify that the output be used to modify an existing worksheet within the workbook file. If you decide to specify the name of a worksheet, the name can’t exceed 32 characters and shouldn’t include any special characters (anything other than numbers and letters). Also, if you choose to modify a worksheet, you can specify where, in the existing worksheet, the new information is to be placed. When you want to produce output, click OK in the Export Output dialog box, and a file is generated. Then you can load the file directly into Excel, as shown here. SPSS output as an Excel file. In this example, the output filename is excel, so the output file was named excel.xlsx.